Asia, with its new-found affluence as the world's lowest-cost and highest-quality manufacturer, is devoting much of its windfall profits to arms. Growth and emerging energy shortages are giving birth to dangerous new tensions. In a great "arc of crisis" stretching from Taiwan to China and from South Korea to Japan, defence spending is significantly higher than that of post-Soviet Russia. Asian nations, including India, are rapidly developing new long-range strike capacities as legions of new missiles and aircraft become operational. This arms race is troubling not only for its pace - rapid even by classic Middle-Eastern standards of the 1960s and 1970s - but also for its technological level which is alarmingly high, with high-performance missiles proliferating. The build-up is fuelled by the economic as well as strategic interest of local Asian arms producers, whose deadly exports of Silkworm and Rodong missiles provoke instability throughout the world. This study explores the linkage between the area's economic growth and its extreme lack of energy resources - it is the world's largest energy importer - and how these energy insecurities are leading Asia swiftly towards a struggle for off-shore oil and nuclear energy, just a short step away from nuclear armament. 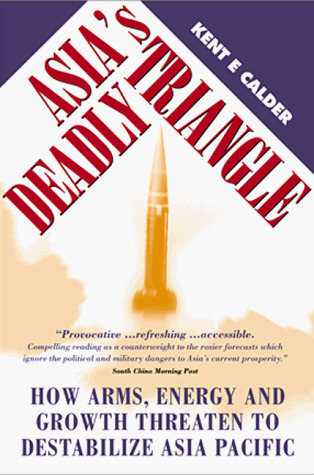 The author shows how close Japan is to having nuclear weapons, and speculates on the capacities of North and South Korea, China and Taiwan. The history of the region is laden with conflict, and the author explains how these tumultuous age-old relationships will affect the area's volatility today. The book provides an overview of where each country is headed politically, and states what role the West should play in these developments. Kent E Calder is Director of the Program on US-Japan Relations at Princeton University and Special Advisor to the Under Secretary of State for East Asia.